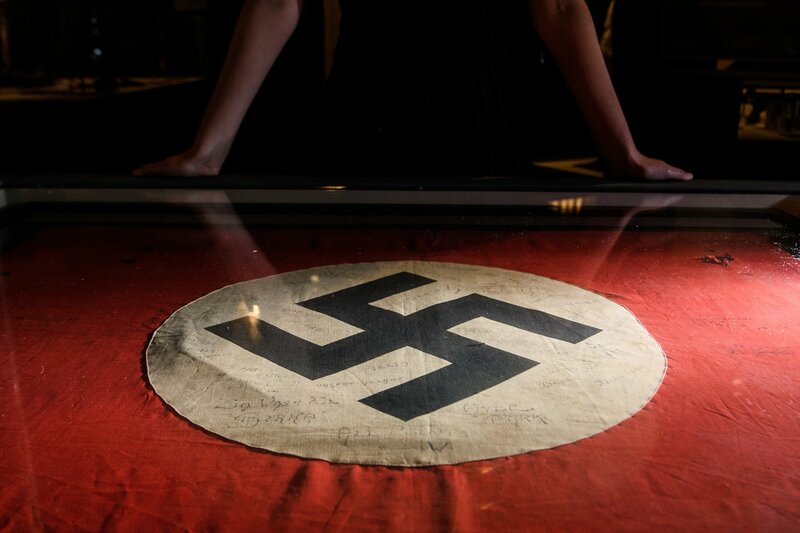 Two Minnesota high school students are facing backlash after posting an image that showed them holding a Hitler-themed sign while making Nazi salutes, the Star Tribune reported. An image posted on social media showed a male and a female student from Minnetonka High School holding a sign that read "Sweethearts would be a Hit(ler) w/you, and I could Nazi myself going w/anybody else. Be Mein? Yes or Nein." The poster appeared to be in reference to the school's Valentine's Day dance, according to the Star Tribune. The picture was published on a private Instagram. The female student shown also posted the photo on social media, writing "Also I would like to state I am not anti-Semitic in any way, I hate all races equally." Principal Jeff Erikson denounced the image in an email sent to staff and students. The message referred to the post as a "deeply offensive message in no way aligns with our school core values: do the right thing and represent us well." The letter continued "please know that we take this matter seriously and are committed to ensuring a safe, positive environment for all students." Jewish community members spoke out against the post and its impact. "They really feel uncomfortable going to school tomorrow. They don’t feel safe, they feel very concerned," Rabbi Tzvi Kupfer told CBS Minnesota. "I think it really rips open a little bit of the feeling of safety that they have when something like this is out there." The Executive director of the Jewish Community Relations Council of Minnesota and the Dakotas said in a statement that the organization is "deeply disturbed by the egregious anti-Semitic image circulating on social media depicting two Minnetonka High School students using the Nazi salute and making cruel and offensive jokes. Such images both insult the memory of Hitler’s victims, as well as the heroic Minnesotans who fought to defeat Nazism." The attack on Pittsburgh's Tree of Life Synagogue in October punctuated concerns about rising anti-Semitism in the U.S. Eleven people were killed when a gunman opened fire. Shortly after the Pittsburgh shooting, a Brooklyn synagogue was vandalized with the phrases "Die Jew Rats," "Hitler," and "Jews Better Be Ready." After news reports inaccurately said that "Kill all Jews" was written during the defacement, the phrase trended on Twitter. The Anti-Defamation League said that anti-Semitic events rose 57 percent in 2017. A survey released in April found that 41 percent of Americans and 66 percent of millennials do not know what Auschwitz was, according to The New York Times.